Those who are familiar with the BBC series Monarch of the Glen will certainly remember, "Archie's becoming the Laird" at the MacDonald Games. For those unfamiliar with the BBC production, the Scottish soap opera has been a hit all over the world, especially where the Scots have landed. Young, good looking leading men and women coupled with the talents of Susan Hampshire and Richard Briers. 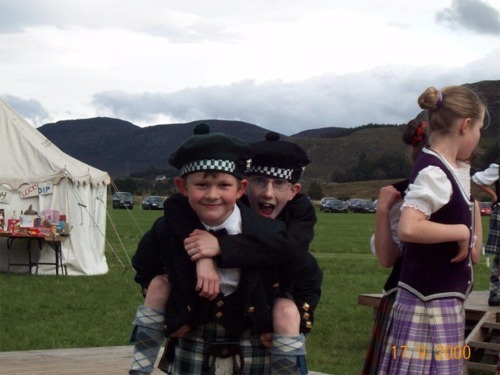 What is a Highland Games without the dancing? 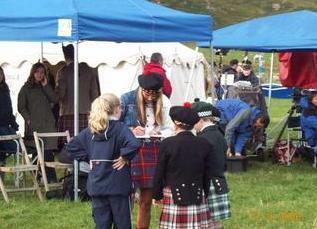 The BBC production staff went to great lengths to make sure the MacDonald Highland Gathering was as authentic as could be. Hence the call went out in the Highlands for dancers! Calum Duncan, 10 years old, was one who answered the call. Calum's mum Eileen tells of Calums venture into the world of show business….and of course the special "perks" the stars get. "I was so immensely proud when Calum was asked to dance for the BBC. They needed a third boy, not necessarily a beauty but he needed to be biddable, Calum, is a cute kid with a tremendous sense of humour and is the best friend of many of the girls. It was the talk of the school, Calum's debut into films. We set off early one Sunday morning last September. It was drizzly and cold but that did not dampen our excitement. The film set was in a large field beneath the hills, it was a superb setting and the colourful crowds already clustering around the marquees really put us in the mood for some serious acting! 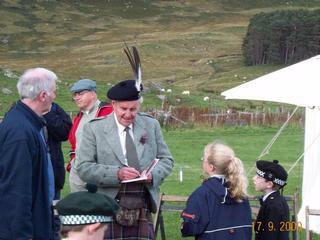 Dad was very quick to notice the young blond girl in the tartan mini skirt. Turned out she was Lexy a star of the show. His mood lightened and he stopped moaning about the miserable weather. There was a huge marquee for the "extras" and breakfast was being served as we arrived. The kids thought this was great - egg and bacon rolls and hot drinks to warm us up. We joined the two hundred plus local people who had been hired as extras for the crowd scenes and tucked in to our breakfast. People milled about in various states of undress, collecting their costumes from the wardrobe mistress in the tent next door and then it was off to makeup. The dancers got changed into their highland outfits and then we heard "dancers on set" being called over the PA. Off my little film star went. 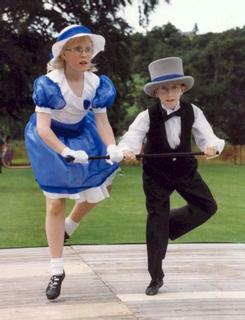 After about an hour curiosity got the better of the waiting dancers' families and we ventured nearer to the film set. We were all invited to join in the filming of the crowd scenes. It was amazing how quickly non-theatrical people got caught up with the story and managed to act well enough for filming. 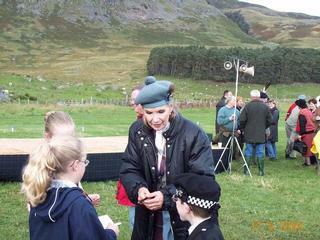 The women especially seemed to have no trouble in mobbing Archie when requested to by the director! The dancers were only allowed to be on set for a short time before going off for a drink and to relax. Then it was back on the boards to do that scene just one more time. Calum says the director asked them just to warm-up just like they would do before a real competition. They did quite a few takes, some warming up, some doing the fling, some just standing around and some larking around and yes they really do say "Action ----- Cut"
On Monarch of the Glen, I went to the stars toilet. My mum said, "that is the stars toilet, you're supposed to use the other toilets" but I said, " They are just the same so I went to the toilet anyway!" (Good for you Calum!) The best bit about it was meeting all the stars. First we went to Lexy, then we went to Archie, Killwillie and then all the others. They were very kind to us. I like going on the stage at Inverness, when the pantomime is on, but Monarch was better even than that!! Post Script - Three months later we were sitting expectantly around the television. Family and friends had been telephoned to warn them of the great event. Did you blink? We hardly saw Calum because a piper walked in front of him just as the camera panned around to the dancers. Poor kid he was so disappointed. Eight hours work for about two seconds of screen time. I'm sure I heard an hysterical giggle from his sister Kristy who was sure that it was divine retribution!